Lt. Ripley saves a child from the Alien. Strength is a combo of brawn and bravery. Steadfast, determined, strong of will, strong of character, strong of body. Lt. Ripley is not the only personification of strength in the Alien movies. The Alien is also a Strength archetype. 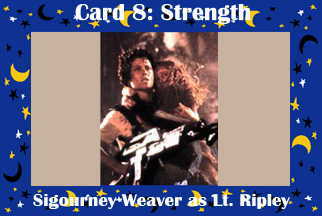 Brave Ripley was laboriously downloaded from The Unofficial Sigourney Weaver Page.